I’m pregnant. I just found out. I’m having an abortion on Saturday at 10 a.m.
And, it seems, no amount of background information — no critical mass of other women’s stories or screenings of “Obvious Child” — will give me much insight into how I, Jenny Kutner, will feel about my abortion when it happens. Still, I have been looking for background information, and I briefly tried to defy my stubbornly non-psychic brain by reading what other women have written about their abortion experiences. The piece is nauseating. 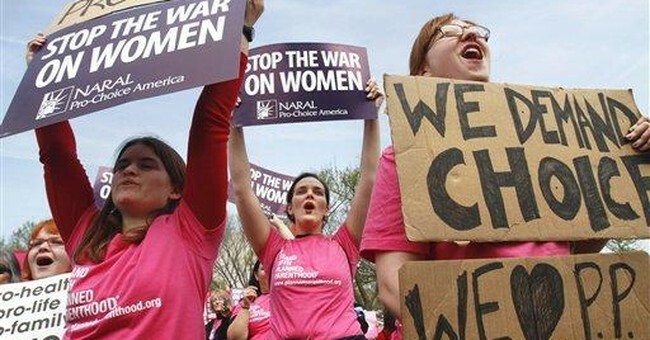 It is another half-baked essay trying to rationalize abortion. Then, Kutner talked about Texas, where she used to live, and how she was proud to stand with other pro-aborts when then-State Senator Wendy Davis filibustered a bill that would’ve banned abortions 20 weeks into a pregnancy, despite the fact that pretty much everyone, including 60% of American women, support the ban. Regardless, she talked about the restrictions in Texas that were eventually passed under Governor Rick Perry and how she would’ve been subjected to them, like having a sonogram and hearing “about the development of the zygote inside me” if she still lived there. Yep, it’s not a child, a baby, or a life; it’s a zygote. At least she didn’t say clump of cells. But, she moved to New York, the abortion capital of the country, so there’s no problem. Just as I did, a counselor called my name and asked me to follow her down a hall to a small, carpeted room with a desk and no windows. On the desk sat a plastic-encased model of a ParaGard IUD, the little copper “T” with which I had entrusted my reproductive health for exactly a year. I stared at it while the counselor confirmed that I was, indeed, pregnant — about five weeks, judging by the start of my last period. I wasn’t sure what to feel after I made the appointment, so I just stood still on the sidewalk for a few minutes and cried. I cried because I was overwhelmed and confused, although I wasn’t at all confused about my decision. The end of her article is almost prophetic where she says, “despite all the support I’ve received, I have walked around furious for the past week at the thought of those anonymous people who would tell me I’m wrong not to stay pregnant.” Yep. As a pro-life American, I’m duty-bound to tell you that what you’re doing is abjectly barbaric, but that’s for a later discussion. Kutner is having her abortion in one hour.